In the wake of COP24 and the IPCC’s dire warnings, one thing is clear: more innovation in clean energy is needed to limit global warming to 1.5˚C. The magnitude and pace of climate change means we can no longer afford to wait decades for clean energy technologies to become available. Innovation-as-usual is no longer enough. Fortunately, artificial intelligence (AI) is emerging as a catalyst for scientific discovery, helping clean energy innovations get to market faster and disrupting existing business models. A unique opportunity exists to apply AI to a specific part of the clean energy value chain: materials. Materials serve as the building blocks of clean energy, such as the solar cells that make up the photovoltaic panels found on rooftops. Innovating the materials used to manufacture components of clean energy is important because existing materials are often toxic, non-earth abundant, and require carbon-intensive processing. This scenario presents an opportunity for the clean energy manufacturing sector. Applying AI to the development of new materials can reduce embedded emissions, toxicity and costs while saving researchers precious time in the lab. Experiments done by trial-and-error are often repeated thousands of times before a breakthrough occurs. Instead, AI could automate complex scientific tasks and enable researchers to focus on tasks that require more creativity and ingenuity. Using AI in this way can give manufacturers an edge. Manufacturers tend to invest in optimizing downstream production functions, which has led to several AI applications in sensor technologies and process optimization. Using AI for upstream design purposes, however, is an untapped business opportunity that could reduce the time it takes to discover new materials, freeing up capital for deployment and commercialization strategies. Current clean energy manufacturing processes are highly specialized, require upfront capital, and are energy-intensive. This is why the market is heavily concentrated in regions with lower operational costs and weaker environmental regulations. Take solar panels, for example. Currently, their production requires temperatures of 2,000˚C. With current technologies, it is difficult to decarbonize heavy industrial processes, so the energy used for such heating is not always emissions-free. In a circular economy, the emissions embedded in the making of the product contribute to the overall emissions profile in the product’s full lifecycle. Using AI to develop clean chemical reactions that use less energy to produce the same products would reduce energy bills, giving incumbent companies an economic incentive to innovate further. Lower operating costs would also give prospective challengers a better shot at market entry. What happens at the end of a product’s useful life is also important, but is often overlooked. With existing recycling processes, only a small fraction of clean energy hardware can be recycled cost-effectively today. 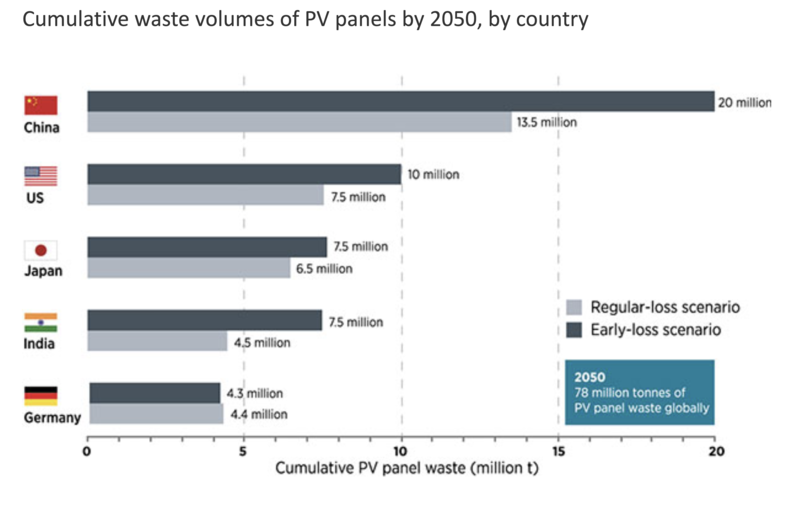 For instance, designing solar panels that can be recycled and re-used could generate economic gains in excess of $15 billion by 2050, according to a 2016 report by IRENA (see figure above). However, designing innovative manufacturing processes is dependent on the chemical properties of the raw materials used. In other words, developing alternative materials can reduce dependence on incumbent manufacturing processes. For example, new materials that are compatible with 3D printing could be produced locally, thereby avoiding global shipping costs and associated emissions. Innovation in materials themselves would spark some much-needed disruption in the industry, making clean energy even cheaper and cleaner. Some clean energy technologies are currently made of rare earth elements. For example, neodymium is the world’s strongest magnetic material and is used in motors and generators such as wind turbines. Rare earth elements are primarily extracted, processed and produced in a few countries where they are abundant and cheap to mine. This dependence on a few countries for raw materials could lead to heightened competition, price volatility and geopolitical tensions upstream in the clean energy value chain. Producing clean energy with earth abundant materials sourced at low cost, therefore, has strategic geopolitical benefits. Businesses can draw lessons from a recent breakthrough in the upstream application of AI in clean energy manufacturing. Meet Ada (Autonomous Discovery Accelerator): the world’s first self-driving laboratory. It is named after Ada Lovelace, the scientist who revolutionized computer science in the 19th century. Ada could transform how clean energy is made at a fraction of the time and cost. By autonomously testing materials at high computing powers, Ada aims to make solar panels more resilient and to turn carbon dioxide into useful fuels. Ada is part of a broader initiative under Mission Innovation, a global collaboration of 23 countries and the European Union, to deploy materials acceleration platforms (MAPs) around the world. Canada and Mexico are driving this strategic initiative as co-leads of the Clean Energy Materials Innovation Challenge, investing in the solution to meet an emerging environmental and industrial need. This technology will soon be deployed in several other countries, creating a global network of robotics platforms tackling specific regional and corporate applications. Governments are making the first move on AI-enabled clean energy materials discovery, signalling that this is an area of strategic national and global interest. Public risk capital helps to drive down costs for industry, enabling the wider adoption of AI in advanced manufacturing. Making clean energy materials cheaper, cleaner, and more durable is not only good for the environment, but also good for business.